Netflix has just dropped the first trailer for The Ridiculous 6, a Western comedy starring Adam Sandler and produced under his Happy Madison banner. When his long-lost outlaw father returns, Tommy ‘White Knife’ Stockburn goes on an adventure-filled journey across the Old West with his five brothers. 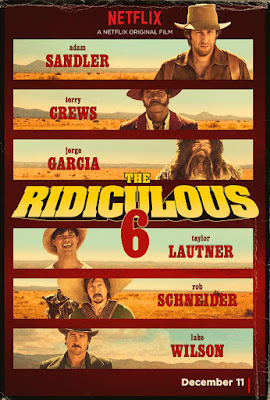 Adam Sandler plays White Knife, and Terry Crews, Jorge Garcia, Taylor Lautner, Rob Schneider, and Luke Wilson play his brothers. Written by Tim Herlihy and Adam Sandler, The Ridiculous 6 is directed by Sandler regular Frank Coraci (Blended, Click, The Waterboy, The Wedding Singer) and will be available on Netflix’s streaming service on December 11.